Delft is located in the province South Holland, in the Netherlands. It is located between the well-known cities of The Hague and Rotterdam. This beautiful little city is known for it’s historic downtown area with it canals. 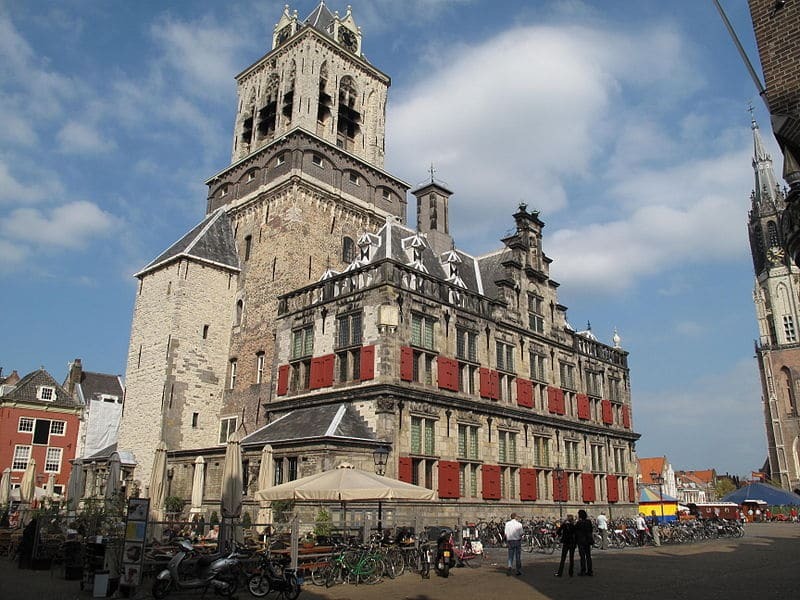 Delft was also the home to the somewhat well known painter Johannes Vermeer. Tip: Also check out my page on things to do in Delft. Delft has been officially a city since 1246 when the Dutch Earl William II granted it a city franchise. The new city began to grow and by 1355 grew to the size it would maintain until the 19th century. Delft has long been associated with the House of Orange, and during the Eighty Years’ War, the city served as a headquarters for the Dutch resistance. When William of Orange was shot dead by Balthazar Gerards, in 1584, the family chose to bury him in Delft due to the fact that the Spanish occupied their traditional burial place. Due to this burial, the House of Orange began a new tradition and Delft has become the official burial place for the family. No city likes to be known for violence, but Delft has two such occurrences in it’s past. In May of 1536 there was a great fire that broke out in the city. It is assumed that the fire was the result of a lightning strike, and in the aftermath, nearly 2,300 houses were destroyed in flames. As if that is not enough, nearly one hundred years later, the city was again rocked, but this time by an explosion. An old convent was being used at the time for the storage of gunpowder. It is estimated that nearly 80,000 pound of the stuff was being stored in the cellar of the old convent. While the cause has never been explained, somehow the power ignited and in the explosion, nearly 200 houses were destroyed. Fortunately there were minimum casualties in the explosion and, but the Delft University of Technology still has a main focus on the science of explosions as part of its research. We have already mentioned the painter Vermeer, but Delft is also well known for their pottery. The Delft Blue Pottery Company, known as Delftware, is very well known for the fine pieces they create. The local economy is comprised of tourism, industry and various retail shops. Education and research is also an important part of the Delft economy with the Delft University of Technology and the Netherlands Organization for Applied Scientific Research. For a small city, Delft has the distinction of being the birthplace of many famous painters, writers, politicians and professional athletes. Even Jan Timman, a chess grandmaster was raised in Deft. With all of its rich history and culture, Delft remains a beautiful and charming city. There are numerous opportunities to relax, go camping, swimming, hiking or even horseback riding around the outskirts of the city. The town center, with its beautiful buildings and picturesque canals and scenery will provide the whole family with an enriching experience. Many people arrive in Holland by air, to the popular Amsterdam airport of Schiphol. You can get to the town easily by train in about three quarters of an hour by changing at Leiden Centraal. If you are arriving at the nearer airport of Rotterdam Den Haag the connection is not so easy. You need to take a bus to Rotterdam Centraal station and change to the train to get to Delft. Or you can take the easier option of taking a taxi straight from the airport for about 35 euros. There is a fast and efficient transport network in Delft which comprises of buses, trams, trains and taxis. The buses are clean, comfortable and reliable. If you are staying and traveling around the town for anything more than a day or two it is easier to buy an OV-chipkaart. To use this you just load up the card with funds at a train station or the tourist information or participating hotels and shops and swipe the card at the terminal as you get on and off of the bus. This will automatically deduct the correct amount from your card. if you are only there for the day it is possible to pay the driver or buy tickets from coin machines at the train terminals. There are only 2 tramlines in Delft, so it is not easy to get lost. If you are going to or from The Hague you will need to catch the number 1 tram that goes through the centre of the town, the journey is very short and in a very brief time you will arrive at your destination. Taxis operate at a standard rate that is fixed throughout the country and are clean and well regulated. You can find them at taxi stands, flag them down in the road, or telephone one of the operating firms to be picked up. Driving is not really easy around Delft as much of the old city is closed to cars and parking is expensive. Probably the easiest way to travel around the town is to do like the locals do and go by bicycle. You can hire bikes cheaply in Delft, but you will need some ID and to pay a deposit first. Delft is a lovely old town which retains many of its original features. Situated in the west of the country it is well known for the famous ceramic Delftware, its large university and for being the home of the painter Johannes Vermeer. Delft is a small town near to The Hague which has a lovely and compact town center much of which is closed to cars and thus all the more enjoyable to walk around. It is easy to make your way and to see all of the sights as they are mostly situated within a 20 walk of the town center. This being Holland there are, of course, canals to wander around if you seek a little quiet. Nieuwe Kerk or the new church strangely enough, for a church, is closed on Sundays. But any other day it is well worth spending some time there. Built in 1496, you will find it at Markt 80. Although you are not able to get access to it, it is here that many members of the royal family were buried, with its most famous occupant being William of Orange. The church has a very high tower at over one hundred meters and for an extra 3 euros, and a bit more effort, you will get some great views across the town and to The Hague. Oude Kerk or the old church is the oldest church in Delft being built in the 13th century. Again it is closed on Sundays. The most famous resident to be buried here was the painter, Vermeer. When it was built the tower leaned out over the canal due to the soil not being sound. The builders, however, just carried on building and set the tower to lean in the other direction to compensate. The Science Centre Delft is a fascinating place to go for and interesting day out. It has many interactive features and is maintained by the university. Delft Historic Tobacco Museum is an interesting visit for anyone interested in the history of the tobacco trade and also has an large collection of pipes. Paul Tetar van Elven museum has a good collection of Delftware of the 1800’s and also some fine oriental pieces. Mooi Weer Spelen is a great place to see street theatre and exhibitions and is usually held in June. Varend corso is a festival and procession of boats decorated with flowers that goes from Westland to Delft and is generally sometime at the beginning of August. Lichtjesavond, or the evening of lights where carols are sung around the Christmas tree in the market square in December. For those that want a quieter holiday than in the busier parts of Holland, such as Amsterdam, Delft can offer an interesting and relaxing destination.